1 Townsman: Governor! Your daughter returned in the company of some pirates! But she's leaving again! 2 Governor: <sigh> I remember the first time she left Port Royal. Sailed away to the south-east on a whim. 4 Governor: Port Royal is in Jamaica, you ninny. 4 Townsman: Sorry, I thought you were fishing for a straight line. Two wrongs combined to make a right in this one. I'd done this joke before. Looking up Port Royal's geographic relationship to Jamaica, I was disappointed to learn that Port Royal indeed was in Jamaica. * If you don't quite get that, "Jamaica?" sounds very much like "'dja make her? ", a casual pronunciation of "Did you make her?" This is a reasonably well known joke, at least in Commonwealth versions of English, but may not be entirely clear to non-native English speakers. 2016-09-16 Rerun commentary: If you sailed directly south-east of Port Royal and kept going until you hit land, you'd end up in an uninhabited stretch of coastline in Venezuela. You'd miss the city of Punto Fijo by just 10 kilometres or so along the way - close enough that you might end up there instead. I was all prepared to say that therefore this was the likely destination of Wendy Wenchgood's initial flight, until I read that Punto Fijo was only founded in the 1940s, and so would have been just another stretch of uninhabited coastline in the mid 17th century. 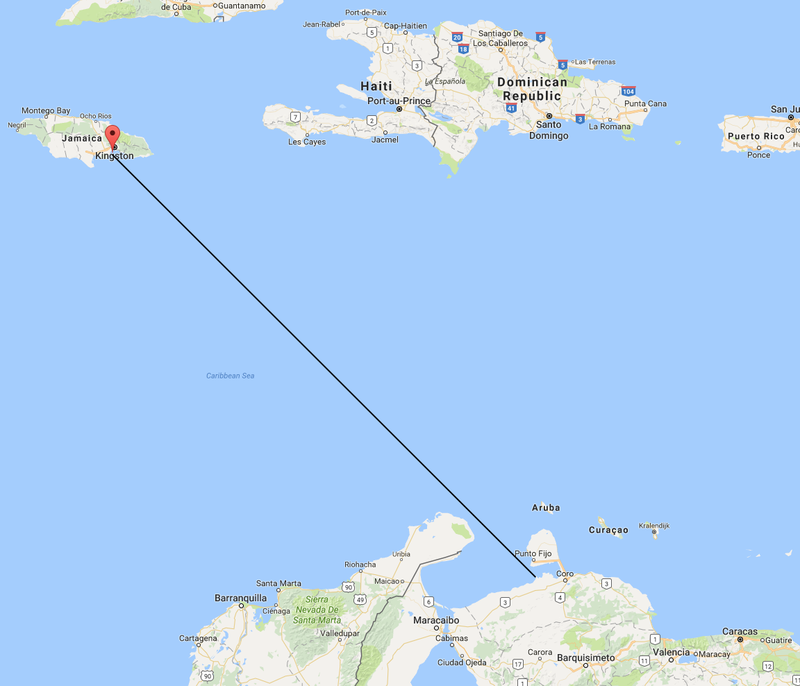 For mapping nerds: Actually, I've assumed that the Google Maps projection of the Caribbean is essentially a standard Mercator projection, so that "sailing south-east" corresponds exactly to a straight line drawn across the map at a 45° angle. Because of the curvature of the surface of the Earth, going "south-east" - i.e. crossing every line of latitude and longitude at a 45° angle - does not correspond to a great circle on the Earth's surface, but rather to a curved rhumb line. However in the Mercator projection, rhumb lines are rendered straight, due to the particular distortion chosen to transform the three-dimensional surface of the Earth onto the two-dimensional map. All good so far for my assumption. But then I discovered that Google Maps does not use straight Mercator projection, but rather a variant known as Web Mercator. The difference is in the model for the shape of the Earth that each projection uses. The Earth is not spherical, but is flattened at the poles and bulges at the equator. The distance from the centre of the Earth to sea level at each pole is 6353 kilometres, while the distance from the centre to sea level on the equator is 6384 kilometres, a difference of over 30 kilometres. The traditional Mercator projection therefore uses an ellipsoid shape corresponding to this non-spherical shape of the Earth, and projects points from this ellipsoid onto the flat map. This ensures the map is accurate, in that points on the Earth end up projected to their correct latitude and longitude on the flat map. Web Mercator, on the other hand, simplifies the Earth shape model to a true sphere, and projects that instead. The result is that places on the Earth's surface can end up being projected to slightly inaccurate latitudes, by an error of up to 35 kilometres if the whole globe is represented on a single map. If you're mapping smaller regions, you can choose a spherical radius that matches a latitude within your mapped region. Places at this latitude will then be correctly projected, and the error will increase from zero as you move to higher and lower latitudes. If your map is relatively local, the accumulated error can remain quite small. If your local map covers a latitude range of 3° or so (333 kilometres), the maximum error at the edges becomes only about 1 kilometre. So the error is only about a third of a percent. Why does Google Maps use this Web Mercator projection instead of the accurate Mercator projection? The answer is that the calculations required to project an ellipsoid model of the Earth are significantly more complex than those for a spherical Earth, and hence take more computing time to work out. And when you are serving thousands of zooming and panning Google maps over the Internet every second, saving those precious milliseconds of computation adds up to faster user response and a significant saving in computing power, at the price of a tiny loss of accuracy. Indeed, for most people the resulting inaccuracy in Google Maps is completely irrelevant and unnoticeable. However, an inaccuracy of a few kilometres can be vital for such things as military actions or natural disaster relief. For this reason, many government agencies absolutely ban the use of the Web Mercator projection for official use. You may (or may not) rest easier knowing that the US military forces most definitely do not use Google Maps to plan bombings and other offensive actions. Last Modified: Saturday, 17 September 2016; 17:40:57 PST.